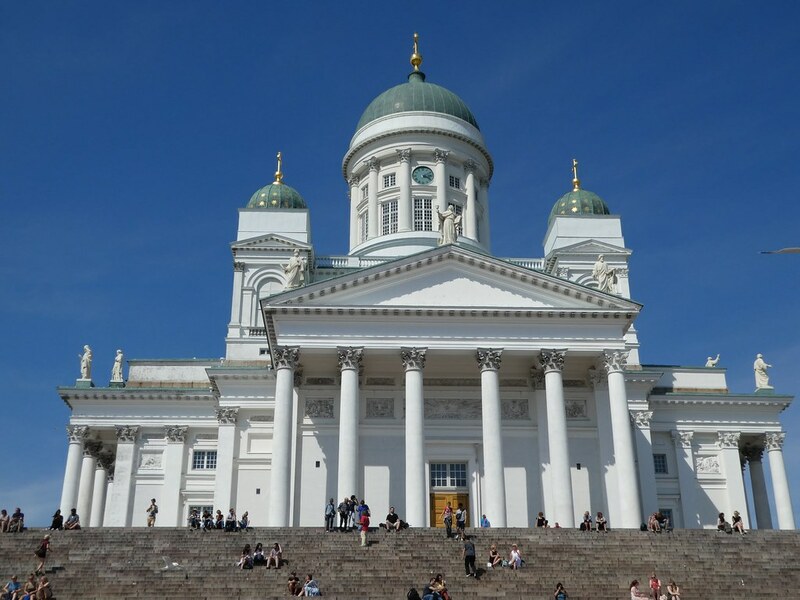 Dominating Senate Square is Helsinki Cathedral, built in the neo-classical style this landmark building was completed in 1852 and its tall green dome can be seen from many parts of the city. Senate Square was designed by Carl Ludvig Engel in 1852 and the cathedral was his masterpiece, majestically dominating the surrounding buildings. The large flight of steps leading up to the cathedral act as seating when performances are taking place in the square below. I’ve visited the cathedral before so if you would like to read about the interior you can do so in my previous post here. To the left of the cathedral stands the University of Helsinki and just beyond it is the National Library of Finland. Being a lover of books it was only fitting that we should take a look inside this building. 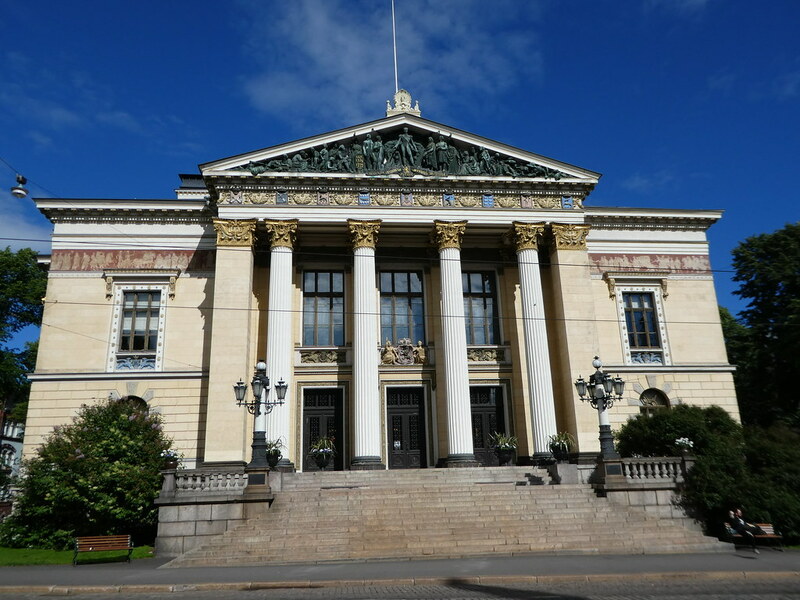 The library is both the oldest and largest library in Finland and is responsible for the collection and preservation of Finland’s printed national heritage. Anyone is welcome to visit the library and it is unnecessary to hold a library card. Bags and coats must be left for safe keeping in the ornate wooden lockers near the door and there is no charge for this service. The library is divided into two principal buildings, its large halls all being connected to each other. Leaving the foyer we stepped into the splendid Cuppola Hall, connected to two ornate side rooms, the North Hall and the South Hall which are both now used as reading rooms. The columns are coated with stucco marble and each hall has its own colour scheme. I just loved the exquisite painted ceilings which are from 1881. 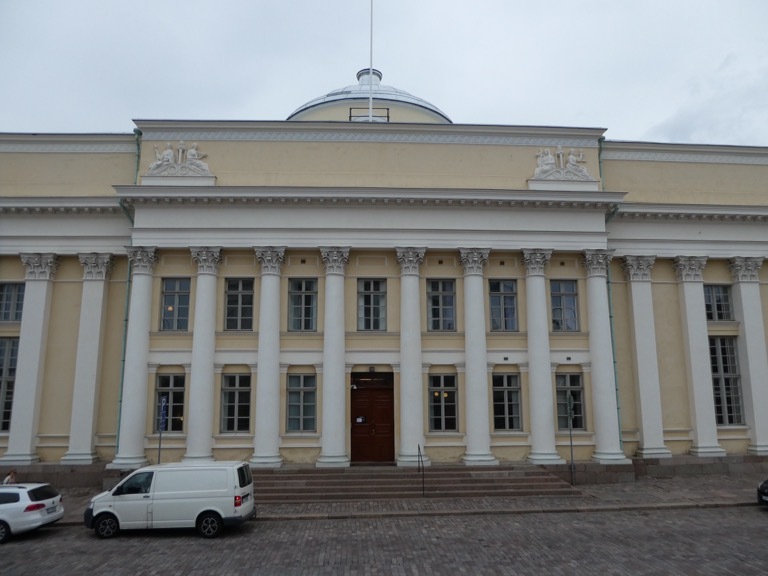 The three halls form a unique suite of rooms in Finnish architectural history, an academic temple devoted to research and science. Connected to these rooms is the annex called the Rotunda which was built between 1902 and 1906 and designed by architect Gustaf Nyström. The Rotunda has six floors and its semi circular extension is surrounded by curved bookcases. Creating natural light, the glass roof is made of iron and its pillars are ornately decorated with reliefs. From the top (6th) floor of the Rotunda we could see all the way down to the ground floor level. 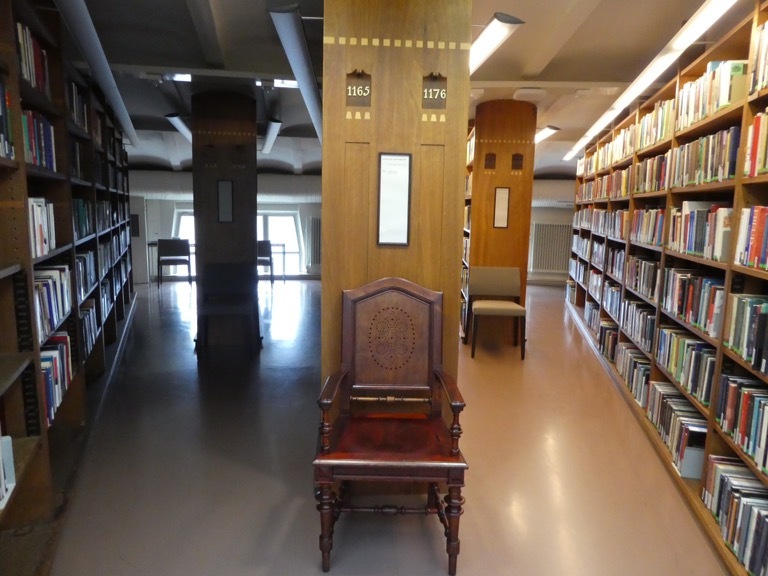 The bookcases have intricately engraved numbering on the ends to enable readers to find their required books and the hall is furnished with some delightful antique chairs. Interestingly, the bulk of the collection is stored in an underground bunker drilled into solid rock below the library. 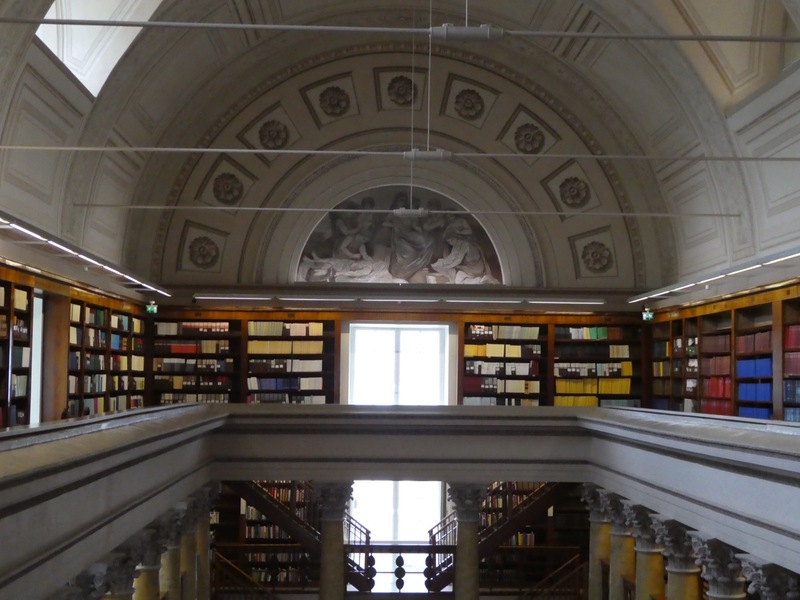 The library collections, the largest in Finland include a total of some three million books and periodicals. 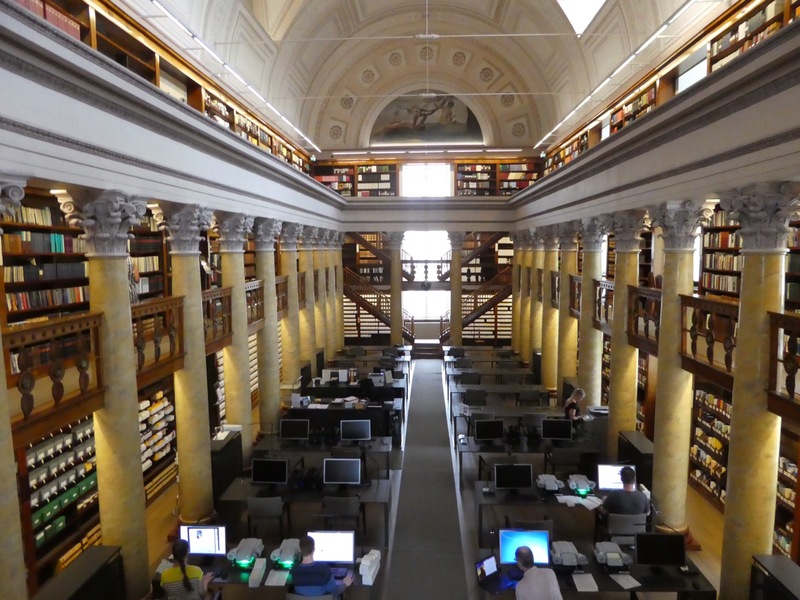 We very much enjoyed our visit here, so if you might be in Helsinki and have an opportunity to visit, do take a look for yourselves, the library’s website can be found here. Strolling across Senate Square we turned left onto Snellmaninkatu to visit the museum of the Bank of Finland. This museum is open daily except Monday and has free admittance, more details can be found on its website here. Being interested in economics we found the galleries very informative. The museum is divided into three sections. The main theme focuses on the operation of the Bank of Finland and the European system of central banks and their monetary policy. 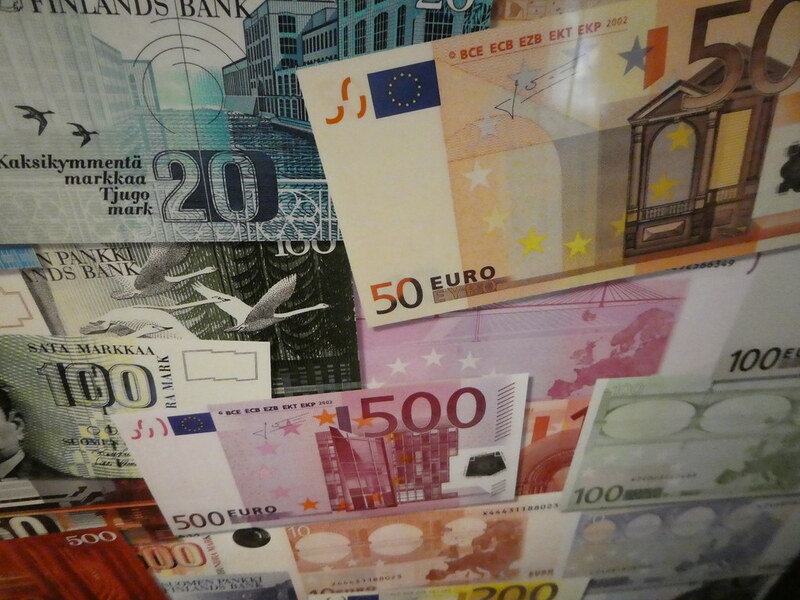 The history section details the history of cash and monetary developments in Finnish society. The third gallery focuses on banknotes and displays the developments in banknote design since the early 19th century. On the opposite side of the road to the Museum of the Bank of Finland lies the majestic House of the Estates. This building was constructed in 1891 and is currently used for occasional government meetings as well as being the location for official coalition talks after general elections. From there we walked the short distance to the market square passing Helsinki City Museum on the far corner of Senate Square. This museum depicts city life through the years and offers a fascinating insight into how the capital has evolved. We then took a tram back to the Kamppi district to return to our accommodation after an interesting tour of Senate Square. It’s artistic, majestic and amazing indeed – definitely a place to explore! Senate Square in Helsinki is a beautifully designed square. Thank you for your inspiring comments. I do hope you have an opportunity to visit Helsinki soon. Yes, thank you Suvi for bringing it to my attention! 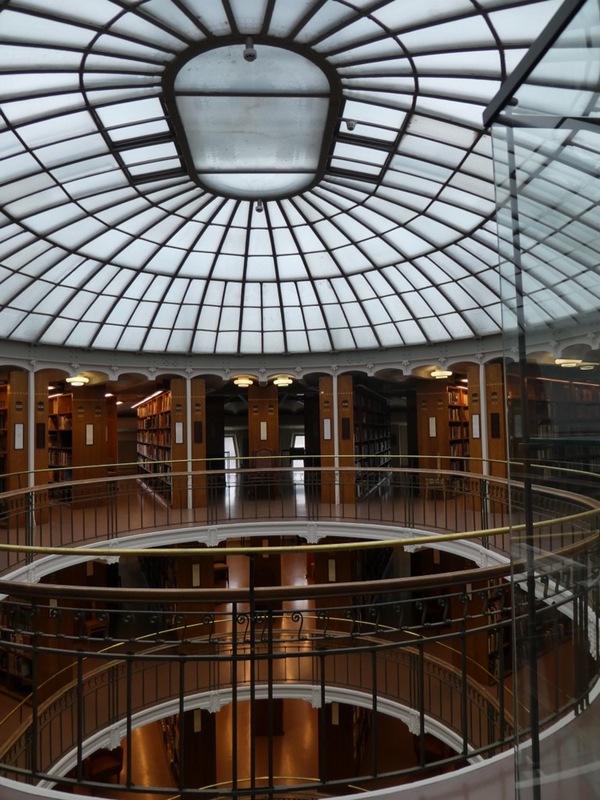 I was told Helsinki is boring but god i would just like to stay in that library whole day! There’s nothing boring about Helsinki, perhaps you will get an opportunity to visit sometime. I’m pleased you enjoyed reading about the library. How do you get some of your images to open fullscreen when clicked? I love Helsinki and visit as much as I can! Don’t these gorgeous old libraries have this effect on us, I loved it too! Thank you. Helsinki is indeed beautiful. Helsinki has many fine historical buildings. Thank you for taking an interest in this post. You do have some interesting experiences and its a pleasure to read your work. Thank you Ian for continuing to support my travel writing, your inspiring comments are much appreciated. Thank you for your much appreciated comments. It’s so nice to read that you are enjoying reading my blog. Thank you, I think they are really beautiful too! What a beautiful reading room Marion; would love to read my books in there. I’d like to read in there too Sue. I love looking round libraries wherever I am! Great post, I really want to explore the Scandinavian countries! Thank you for taking the time to read my post. I do hope that you get an opportunity to visit the Nordic countries soon. Wow. The library sure is opulent. I would love to “study” there. Are the underground books all of the historic ones that they wish to preserve? I think they are historic ones stored underground. I just love looking n libraries wherever I go! I do hope you manage to fit in a visit to Helsinki as it’s so beautiful. Thank you for your kind words. Wow that library is super cool, I will try to go there when I visit. I hope you get a chance to visit soon. I love visiting libraries around the world! Oh, that library! Beautiful photos! It’s gorgeous, isn’t it! I’m so pleased I got an opportunity to look inside. Thank you for your welcome thoughts. Thank you Dani, it really is lovely. Sure looks like Helsinki loves its neoclassical pillars. Yes, the city has a lot of neoclassical buildings, I just love them. Thank you for taking the time to read this post and for your comments. I suppose it was just a coincidence that the city really started to develop when the neoclassical style was most popular. The library looks beautiful, as does the rest of Helsinki. I would really like to visit Finland, but it was way more expensive to get to than Stockholm when I was booking flights. Maybe next summer! Norwegian sometimes have some good offers on that route. Hope you get to visit Finland soon. I love how you always find something different to do Marion. I’m fascinated by libraries, I love to visit them wherever we go but this one looks pretty special. Like the sound of the bank museum as well. I love libraries too and I’d wanted to visit this one for sometime but not managed it previously. The Bank museum was very interesting but so very quiet with only a couple of people plus us. I think it might be a good idea for them to advertise it a bit more. What a beautiful library!! It reminds me of the British Museum in London. I’d love to visit Finland! Thank you for your kind words. I’m sure you would enjoy visiting Finland and I hope that you are able to do so sometime. very well written, have to say pictures are amazing of this beautiful place. Thank you taking the time to read this post and for your inspiring thoughts. Great tour. Wow we sure would love to hang out in that library for a long while. I’d like to do that too! Libraries always interest me. Thank you for your kind words. Thank you for your welcome thoughts on my Senate Square post, they are much appreciated. Thank you for your kind words Annie. It’s encouraging to receive such positive feedback. Wow!! I must say this place is beyond amazing!! Thank you for your kind words. It’s so pleasing to read that you find Senate Square of interest. That library is so beautiful. The National Library is really beautiful. Thank you for your kind words. Maybe one day i will visit Finland. I do hope you get an opportunity to visit Finland as it has both beautiful nature and interesting towns and cities. Thank you for your welcome thoughts. Thank you for your much appreciated comments. It’s so pleasing to read that you enjoyed reading this post. Thank you for your kind words. I’ll take a look at your Guadeloupe photo of the Theatre de la Renaissance building now and see what I think! High quality post full with information and beautiful post. I see that You are devoted to the subject thoroughly. 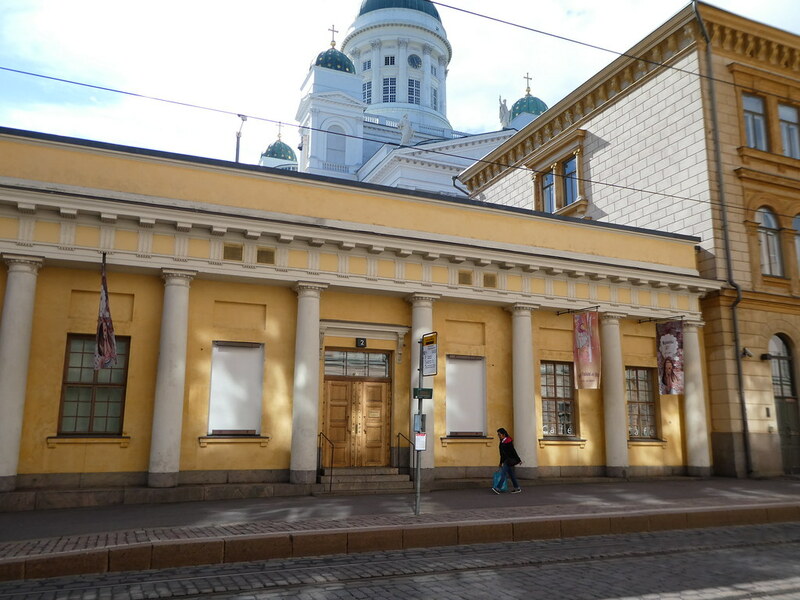 I have not visited in the Bank of Finland Museum. Last time when I presented Helsinki Cathedral, it was in 2011 inside / outside, winter / summer, as background of Samba Carnivals and once at sunset. Thank You for this well-made post. Thank you for your inspiring thoughts Matti, I’m pleased you enjoyed reading it. Perhaps you could take a look inside the Bank of Finland Museum sometime as it’s very interesting. M.